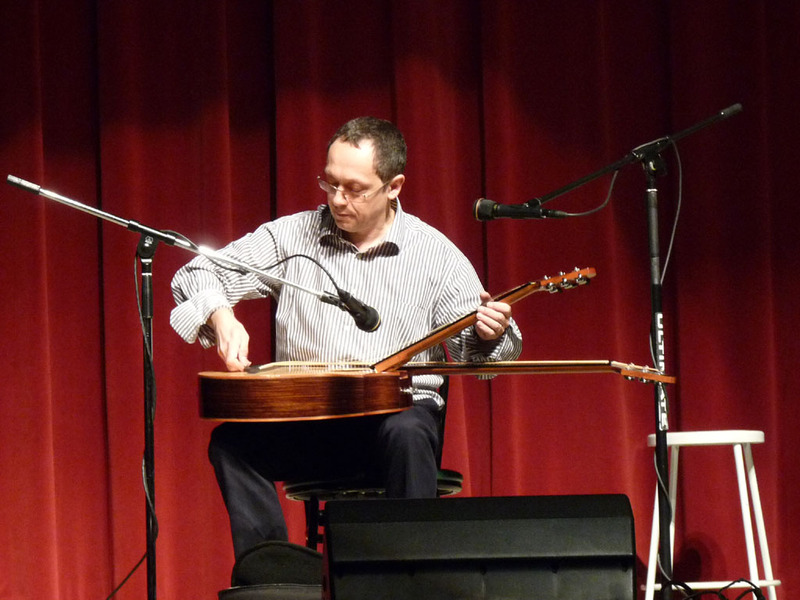 Our second year Foundation–sponsored musical guest was Philippe Fouquet from the town of Tours in France. 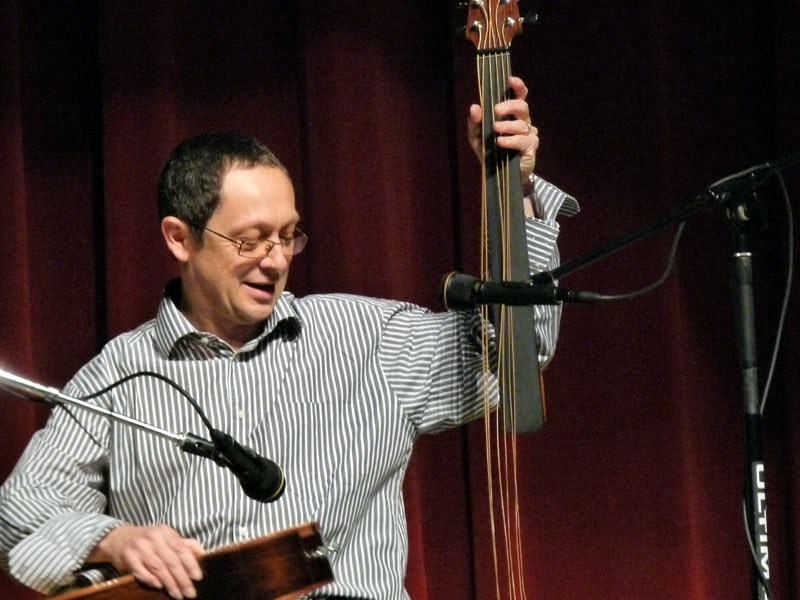 He of course traveled light, as he plays the original OHG – the world’s first “travel harp guitar” that he commissioned from Luke Brunner. Like the one I demo’d at last year’s Gathering (now sold), all were impressed with Philippe’s instrument, which approaches the sound of a full size Dyer. 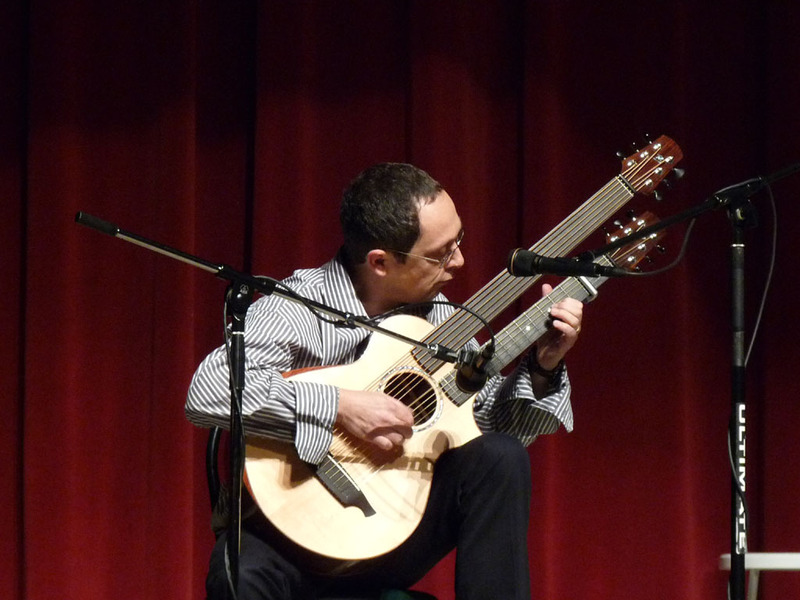 The audience was equally impressed by Philippe’s presentation and performances, which did not skimp on the virtuoso harp guitar compositions that he now has well under hand. Frank (Doucette) playing me some songs by a fellow 6-string Wingert guitar owner he had met a couple of years back. The discovery that this fellow (Philippe) had recorded one piece on an old Viennese harp guitar he had found on eBay. Our correspondence with him to encourage and solicit additional harp guitar pieces. 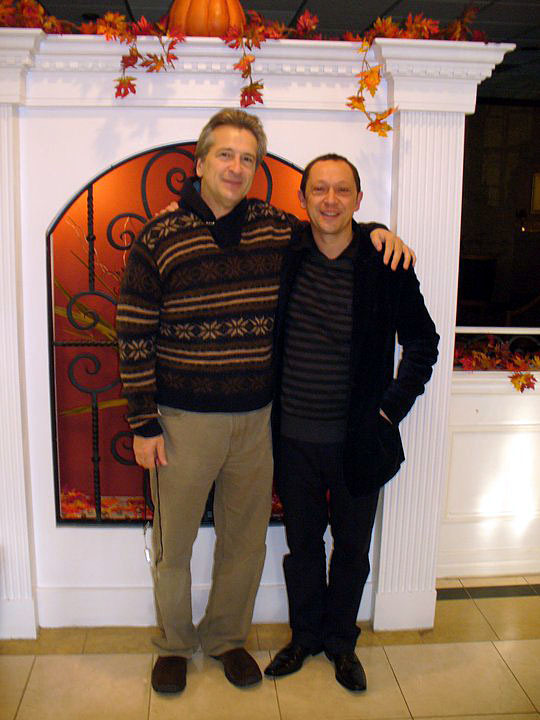 His wonderful tune Les fleurs de l’aube – which he recorded 3 separate times as we worked to perfect the arrangement and performance to fit with the concept album Harp Guitar Dreams. The last minute pulling of the tune from the CD master due to subtle but irresolvable difficulties with his antique guitar’s intonation. 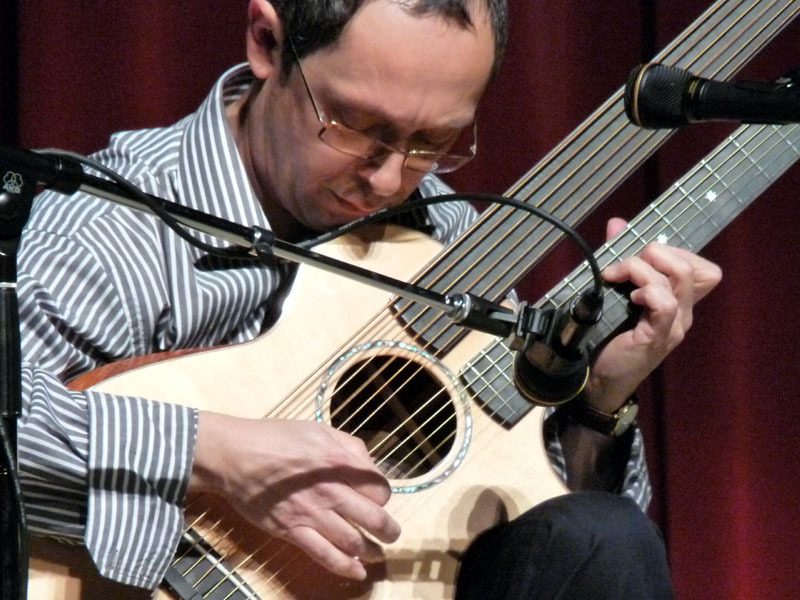 Philippe taking the devastating rejection and making it his “Turning Point” – within a year, commissioning an entirely new harp guitar invention (the Brunner OHG), developing a whole new harp guitar performance technique on it, and writing and recording a whole new repertoire of harp guitar tunes. With some 6-string guitar pieces, this became the CD Turning Point I was honored to release on my Harp Guitar Music label a year ago. His European successes with gigs and interviews (both print and video), culminating in…. Our opportunity to bring him over for his first trip to America, a guest of The Harp Guitar Foundation, and a true harp guitar star. So yes, Philippe’s opening number served as the perfect soundtrack to the story – as I was struck by what an amazing journey of fate this has been for both Philippe and I, and in such a short time. And finally, we met face to face, with a physical embrace – and a whirlwind weekend of music, joy, tears and laughter cementing our mutual musical interests, our collaborations, our friendship. Here’s to continued adventures, Philippe! I feel so proud and so much happy that all this story happened. I also feel much excited about it’s future developments. All this is only passion; love of music; love of guitar and harp guitar; love of the people. My heart is full of gratitude for the Harp Guitar Foundation through the persons who created it and also for the so warm welcome I received from all of you during the gathering. I hope that I have given at least as much as I have received. I sincerely wish to meet you again in a close future.